the new bike lanes in Copenhagen. Every day, one-third of the people of Copenhagen ride their bikes to work or school. Collectively, they cycle more than 750,000 miles daily, enough to make it to the moon and back. And city officials want even more people to commute, and over longer distances. So a network of 26 new bike routes, dubbed "the cycling superhighway," is being built to link the surrounding suburbs to Copenhagen. Lars Gaardhoj, an official with the Copenhagen capital region, says the routes will be straight and direct. "It will be very fast for people who use their bike," he says. "This is new because traditionally cycle paths have been placed where there is space for them and the cars didn't run. So now the bike is going to challenge the car." The first highway, to the busy suburb of Albertslund some 10 miles outside the city, was completed in April. To test it, I got a rental bike and went out for a ride. One of the first things you learn about these bike lanes is that you have to move in fast. This is not leisurely biking — this is serious stuff in Copenhagen. It's a parallel world of transportation: You've got the cars on the roads and the people on their bikes. There are thousands and thousands of people on their bikes here in this city. The city is building more than two dozen lanes from the suburbs into the city. They cater to cyclists by including such things as rails and footrests at stoplights. 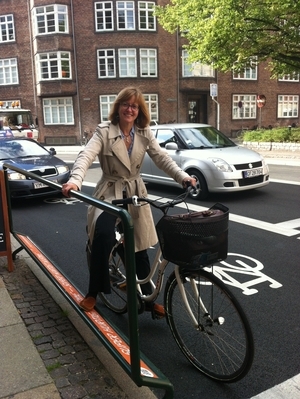 As commuters pour into Copenhaghen on the new highway, I stop biker Cona Endelgo at a red light. Endelgo says he used to drive his car to work, but biking is better. "It gives you more exercise and motion, and it's more free, and it's quicker. When I pass the harbor, I wave to the cars," he says. Each mile of bike highway will cost about $1 million. The project is to be financed by the city of Copenhagen and 21 local governments. And in a country where both right- and left-leaning politicians regularly ride bikes to work, it has bilateral support. Several innovations are being tested, like "green wave" technology, which times traffic lights to suit bikers. If you maintain a certain pace, you can ride all the way through into the city without stopping. There are also footrests with bars to lean on at traffic lights, and a bike pump every mile in case you have a flat. 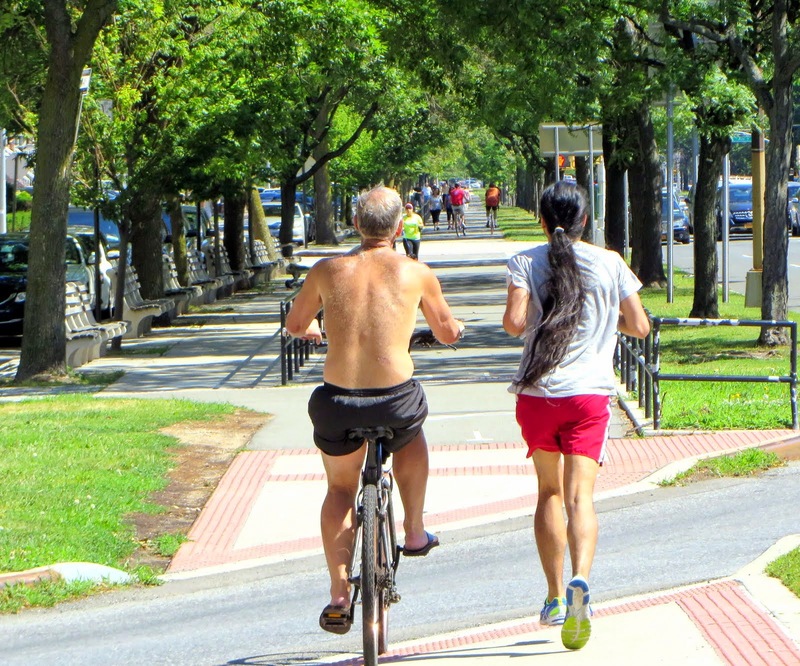 Outside the city, the pace is slower and people talk to each other as they ride. Jacob Messen, 33, is on his way to a water park with his kids. He says support for the project runs deep. "Bicycles are a very essential element in most people's lives in Denmark," he says. "We have them as small infants and all the way up through the ages." He's not kidding. Another rider, 83-year-old Soulva Jensen, is using the highway to visit her daughter in a neighboring town. "The trains are too much trouble at the moment, so I thought it was easier to take the bike," she says. Once the highway network is completed, an estimated 15,000 additional people will switch from driving to biking. And that, say officials, will have a direct impact on the environment, public health and finances. 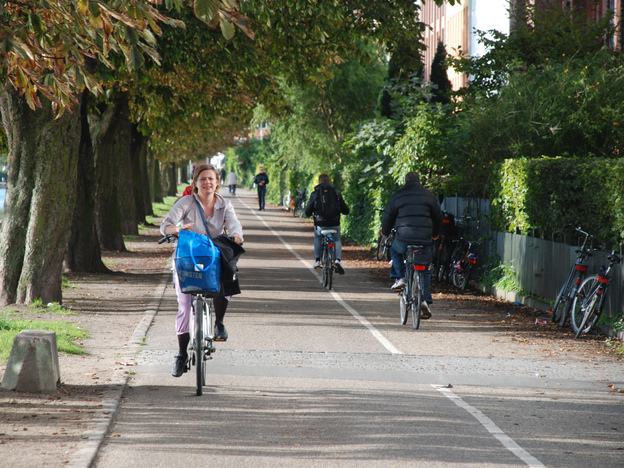 The bike highway alone is expected to save Copenhagen's health care system some $60 million a year.